Want to create the next Facebook or LinkedIn? In this round-up installment, we take a close look at some of the best WordPress social network themes out there for 2019. Building a complex, fully featured social networking website can prove an undertaking – and expensive. 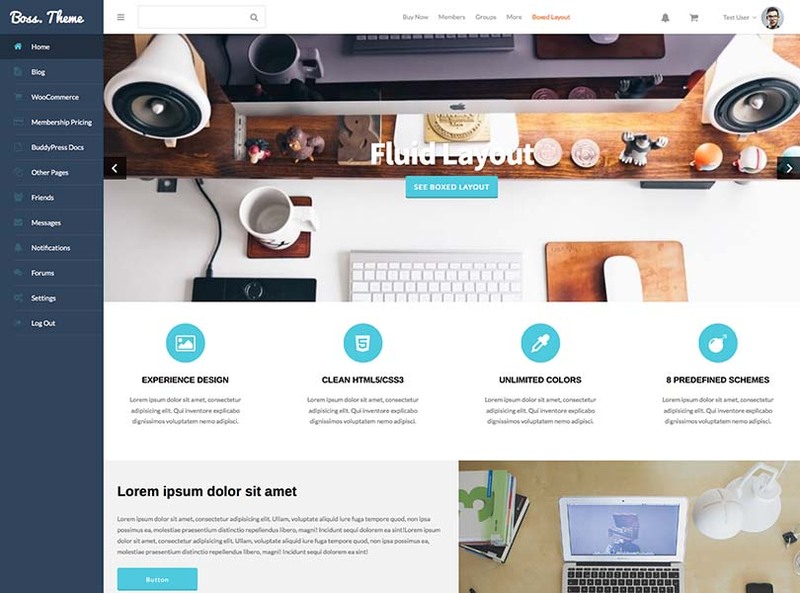 WordPress, combined with one of these themes, has the potential to give you an inexpensive head start. If you can’t find exactly what you’re looking for here, you might be interested in our related article 14+ Best WordPress Dating (and Community) Themes for 2019, though there is a bit of crossover. You may also want to check out our list of top WordPress membership site themes. Currently, the most basic requirements for a social networking theme is – you guessed it – full integration with the BuddyPress plugin. And if there are community and social networking themes out there for WordPress that don’t implement some combination of BuddyPress and bbPress, we didn’t stumble across any of them. With the exception of our top picks, most of the themes on this list are premium themes found in the ThemeForest marketplace. This is increasingly difficult to avoid, and you’re unlikely to find a free WordPress social network theme like Facebook that covers all the bases and looks good, too. That’s not to say there aren’t free BuddyPress themes, but most will offer a fairly basic implementation. Boss 2.0 is probably the leader of the pack at the moment, when it comes to WordPress social networking and BuddyPress themes, and for good reason. Along with its contemporary, expertly-conceived design and UX, the features and usability enhancements are almost flawlessly integrated. It’s one most comprehensive BuddyPress solutions available, and it’s clear after only a few minutes of demoing and use that development team has crafted every detail with the utmost care. Boss 2.0 not only supports ten+ of the most popular BuddyPress add-ons, but the team went the extra mile to provide full support for other popular plugins like WooThemes Sensai and WooCommerce. It’s going to work just as well for a private, corporate intranet as it will for a public social network and community, and will perform exceedingly well while doing it. The user experience is consistent and strong across the full range of mobile and desktop devices, proving true the axiom that the best design is invisible: there’s nothing extraneous or distracting here that drive away users, or annoy company employees (who might need to depend on it for sharing files and documents). The theme is SEO friendly, translation-ready, and well-documented. And perhaps the best part about it is that it was built by and maintained by a proven company that specializes in BuddyPress. You can count on the Boss 2.0 being kept up-to-date and expertly supported. These folks have a lot of experience with the platform, and it shows. Highly recommended. 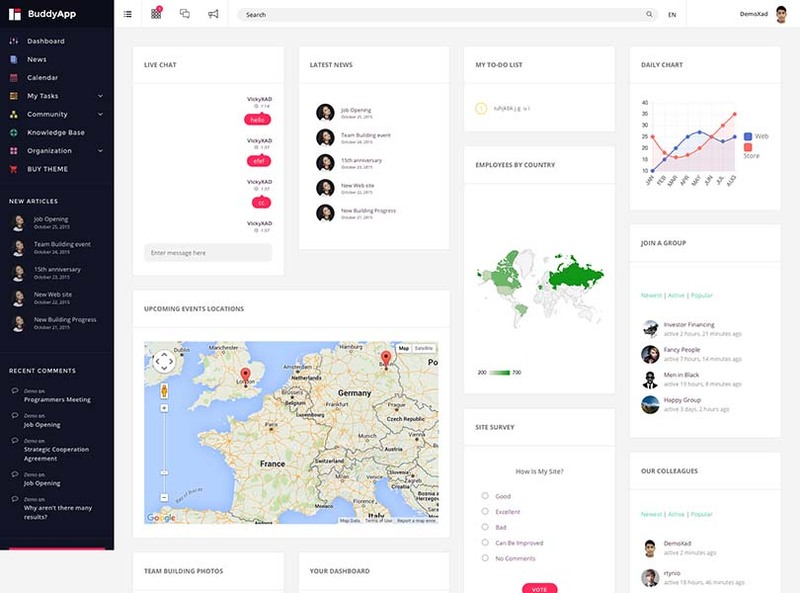 Note: if you’re looking for something a bit more streamlined/minimal, this developer’s OneSocial theme is a good match for building user-friendly community sites. BuddyApp’s claim to fame is its fantastic, mobile-first design. Aesthetically, the design of BuddyApp has a lot in common with Boss 2.0, above, and there’s more than a few similarities in terms of UX and usability, too. Once again, this is product that will adapt well to use by companies and private intranets, or can be used to build a public social networking website. It boasts an elegant & well though-out integration of BuddyPress, and the development team keep things simple and streamlined by tailoring its UX to the most common add-ons. Real-time usability features like AJAX searching and live notifications will make it all the more attractive to end users, and features like Facebook login with help to encourage sign-ups and visitor engagement. The theme is versatile, too. Drag & drop page building is provided, for making quick and easy changes to layout without coding, and the back-end opens panel gives site owners branding and customization options. BuddyApp is retina-ready, as you might expect, and translation ready with support for WPML. Coded with best practices in mind, and well documented. It may be the sleek, modern design of Lynk gives it an edge over other BuddyPress social networking themes. Lynx is optimized for user experience, featuring high performance and cutting-edge usability features like AJAX global search and front-end forms for posting. Live notifications are also supported. The theme is easy to install, and offers plenty of options for customization. SEO friendly and responsive (as you’d expect). Developed first-and-foremost for social networking, Flocks has the distinction of additionally supporting GeoDirectory plugins and functionality (although these plugins are not included, and must be purchased separately). Social features are handled by BuddyPress and bbPress, and the theme was recently updated to add support for WooCommerce and BuddyPress Media. A messaging system is included, and Flocks supports social login. Fast and fully optimized for mobile devices. Be sure to check out the product page and demo for a full run-down of everything Flocks is serving up. 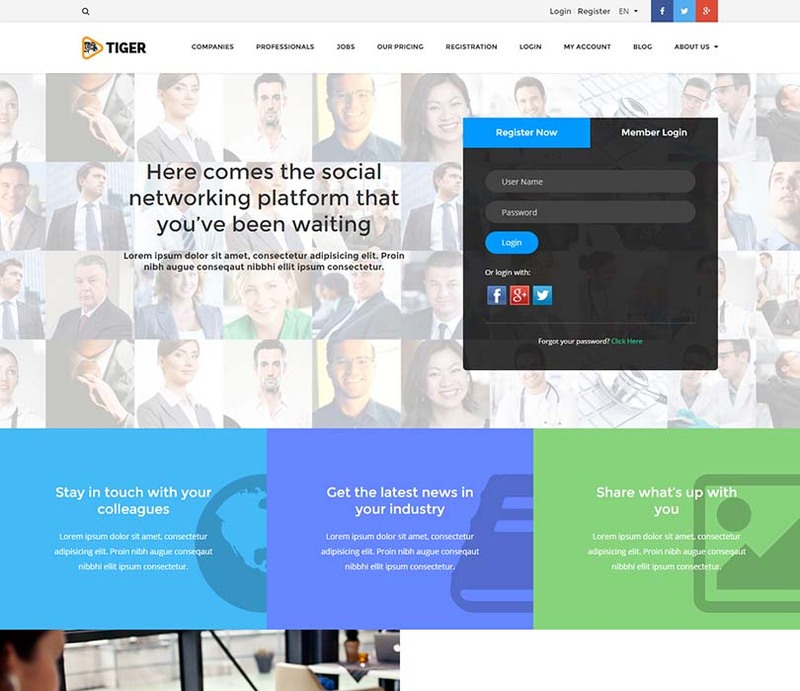 The business-oriented social networking theme Tiger, released over the summer, was built and designed specifically with companies and professionals in mind. Although not a BuddyPress theme, the feature set is comprehensive and deep. The design is clean and corporate-flavored, and the user experience is smooth and friendly. This one will work flawlessly no matter what device you load ‘er up on. But it is a bit different than some of other picks, in that the design and UX isn’t necessarily what some will be looking for out a social networking theme–to get a better idea of what Tiger has to offer, and if it’s right for you, be sure to click through and check out the demo. Socialize might be the most fun, visually-engaging social media themes on our list, and approaches its design and its implementation of BuddyPress in a way that suggests it’s been tailored toward building public, web-based social networks as opposed to private, corporate intranets. There’s an undeniable magazine/blog aesthetic at play that would make Socialize a good choice for building Facebook-style communities, where users share and promote their favorite media/new stores/videos with friends and colleagues. Functionality is further extended by excellent Porfolio, WooCommerce, and bbPress support. Lots of cool back-end options and Visual Composer provide site admins with the ability to tweak and adjust layouts, fonts, colors, and other elements quickly & easily. Socialize is SEO optimized and WPML/translation ready. Like the other options we’ve looked at so far, the restrained design of Monarch mostly minimizes extraneous gimmicks and puts user experience first, although the developers have managed to include a bit of visual flair (CSS3 transitions/animations) without sacrificing the UX. Functionality is exactly what you’d expect, with excellent integration of both BuddyPress and bbPress. You won’t find many surprises with Monarch (support for cover photos is a nice, welcome touch), but you will get an extremely solid, lean product with a professional, classy design that does exactly what it ought to do, and does it very well. Monarch is retina-ready for sharp display on the latest high-res devices, it’s translation ready, and it’s built on the popular Bootstrap 3 framework from Twitter. Good stuff. 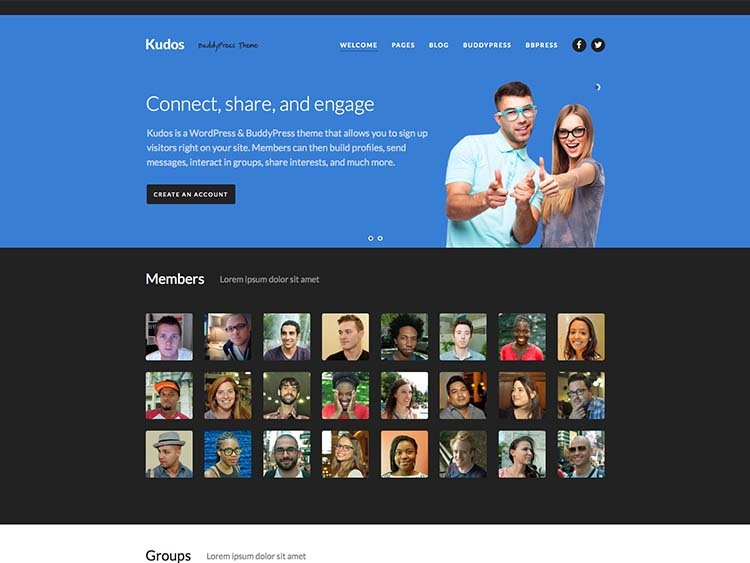 Perhaps the strongest feature of Kudos is its simplicity: it supports BuddyPress and bbPress, providing everything those two popular plugins have to offer, but the light-weight, almost minimalistic design has the side benefit of providing an above average experience for visitors and users. It’s not bogged down with excessive visual elements and animations, and is fast, intuitive and enjoyable to use. An overdose of CSS3 flourishes and jQuery magic, while impressive to many contemporary designers (and theme buyers! ), actually has the potential to alienate users and send them straight to the back button. Good design should be invisible. Beyond a seamless integration with BuddyPress and bbPress, the theme also has some nice secondary features: it’s responsive, of course, but also retina-ready for display on the latest high-resolution devices. The popular LayerSlider is bundled free, to aid in creating an engaging homepage slideshow, and Kudos is SEO optimized using best practices to help you score a top spot in the SERPs. Color options and logo upload leave room for branding, and the theme is translation ready. A good deal overall. 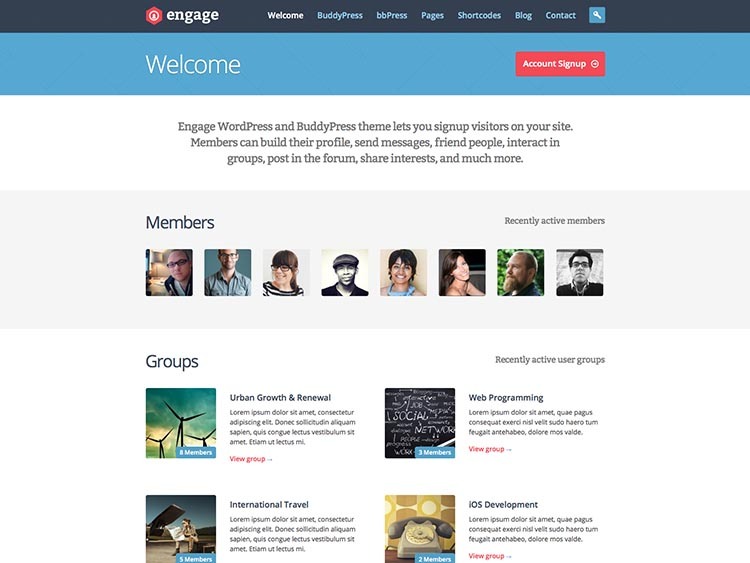 Engage is a social networking theme for WordPress that takes advantage of the BuddyPress and bbPress plugins to help you build a robust, active community website. The design is modern, flat and clean. It’s visually appealing without over doing it. Users can sign up easily, creating profiles, friending other users, participating in groups and more. The theme is easily customized thanks to the extensive options panel in the admin: change colors, headings, backgrounds, and fonts. The theme is responsive, and translation ready. Layered PSD files are provided should more customization be necessary. Extensive documentation is available to help new and seasoned WordPress users alike. 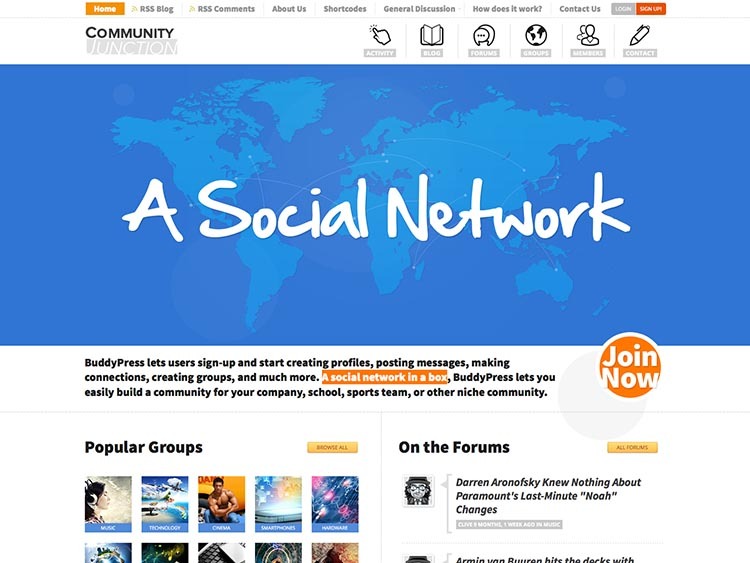 United Community is a social networking theme that combines the best modern design and usability practices into one fantastic, intuitive package. The colorful layout is optimized for display across the gamut of mobile and desktop devices, and careful integration with BuddyPress gives site owners the ability to build and manage a robust, full-featured community site. Admins can take advantage of the hundreds of extensions available for the BuddyPress plugin (including events calendars, music managers, and more). The developers have also provided support for the popular WooCommerce plugin, providing the theme ecommerce capabilities. The theme is easy to install, and users can tweak and customize the theme in real-time using a back-end panel integrated with WordPress’s own Theme Customizer API. Detailed documentation is provided, and United Community is translation ready. 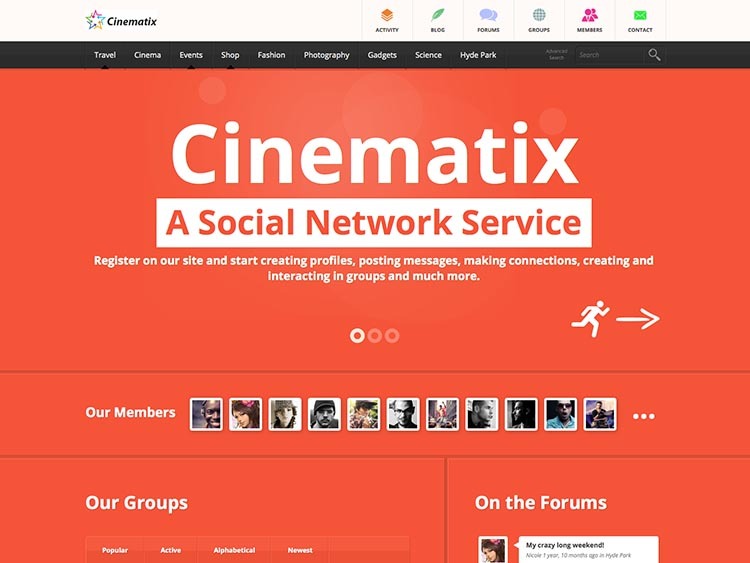 The Cinematix theme has been carefully integrated with bbPress and BuddyPress to give users the best community and social networking experience possible. Signing up and creating profiles is a snap; users can post messages, contact other users, build groups and more. 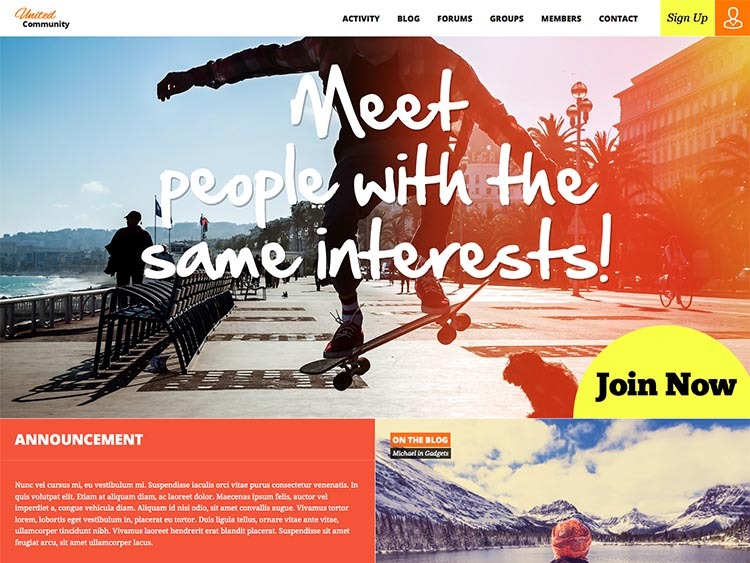 The bold, high contrast design will make a strong impression on your visitors the moment they land on your site. Though the name brings film and movies to mind, Cinematix can be easily adapted for use by teams, companies, schools and a variety of other hobbiest communities. Ten color schemes are provided out of the box, and more customization is made possible, without coding, by the theme options panel and included PSD files. There’s lots of support for other popular third-party plugins, too. Cinematix is compatible with WPMU, WooCommerce, Contact Form 7, and it even works great with Events Manager. 40 page templates make this fully featured social network solution for WordPress. Highly recommended. The Buddy theme is a bit older now, but you’d never guess it from the design and excellent features. We very much admire the minimalistic design and familiar layout. Buddy excels at user experience, and your members will feel right at home, right away. We expect this is exactly the kind of design many of our readers have in mind for bringing their own social network to life. The developer works hard to keep things up to date and relevant. 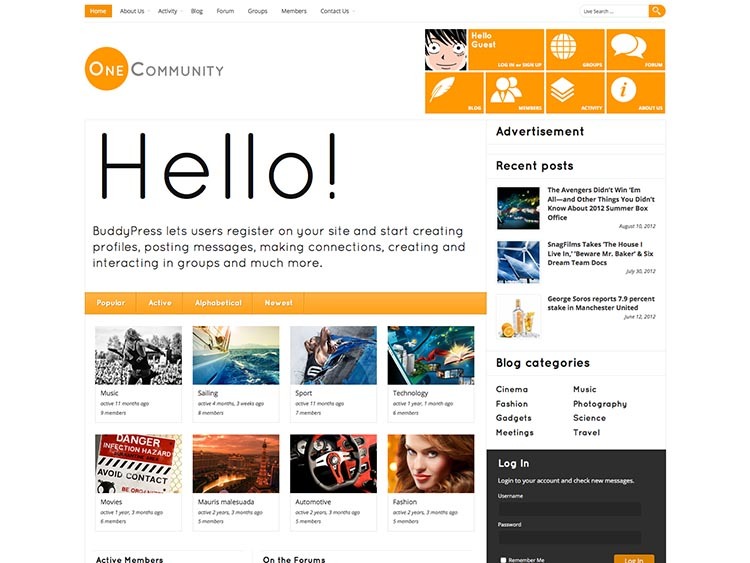 Buddy is responsive, retina-ready and fully integrated with both bbPress and BuddyPress. The theme is is easy to install, use and customize. The provided selection of powerful shortcodes will allow you to build your own layouts, as well as add elements like video, tabs and sliders to any page. Buddy is SEO optimized and translation ready. The 4.5 star rating on ThemeForest means that you can count on the support team to help you if you run into a wall. PSDs are included for additional customization, and demo content is provided by the developer to ensure a painless setup. The friendly, warm design of OneCommunity makes it an excellent starting point for your new social networking and community website. Bright colors, high contrast, gorgeous typography and a smart use of white space work together to make this theme a stand-out. BuddyPress is fully integrated, and your visitors will have no problem signing up, making profiles, engaging with other users and sharing their content. You can even take advantage of the 100s of third party BuddyPress extensions to add more functionality. The full list of features is extensive, and if you have the time we recommend taking a look at the product page for a comprehensive breakdown. This theme was developed by Diabolique, the same team responsive for the Cinematix theme. These folks rule at building social network and social media WordPress themes. Community Junction is the third social network template from developer Diabolique (along with Cinematix and OneCommunity) and, surprise – it’s every bit as feature rich as the others. The wide, responsive layout scales down to look great on even the smallest mobile devices. CJ is compatible with WooCommerce, WPMU, Contact Form 7, BuddyPress and bbPress. Easy to follow documentation makes setup easy, and PSDs are bundled in should additional customization be required. 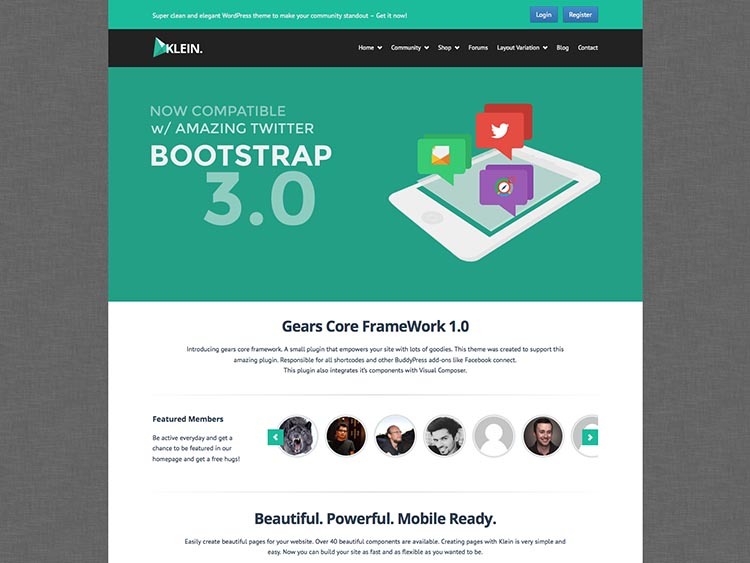 At first glance it might not be obvious that Klein is a WordPress social networking theme – the design has a lot in common with familiar corporate/business web design trends. 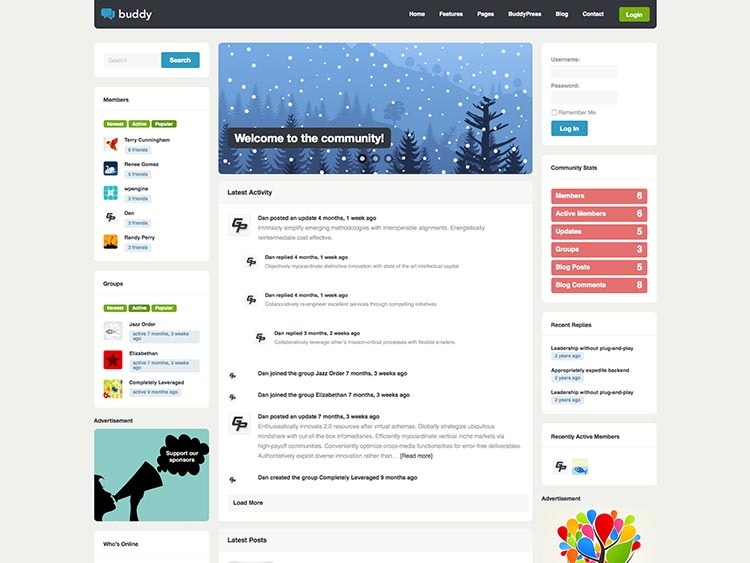 But it is a fully featured community theme with support for BuddyPress, bbPress and WooCommerce out the box. Users can create their profiles, add friends, and share the intimate details of theirs lives with vague acquaintances and near strangers, just as they would on any other social networking site. BuddyPress extensions like Activity stream, members loop and group carousels are fully supported. Klein also has a couple groovy extras bundled in for your web developing pleasure: Visual Composer, the popular frontend page builder, and Slider Revolution, everyone’s favorite slider plugin. It’s also been tested and integrated with modules like Paid Membership Pro and Contact Form 7. If you want to know more – there’s definitely more – check out the product page. We’re just too lazy to list it all. 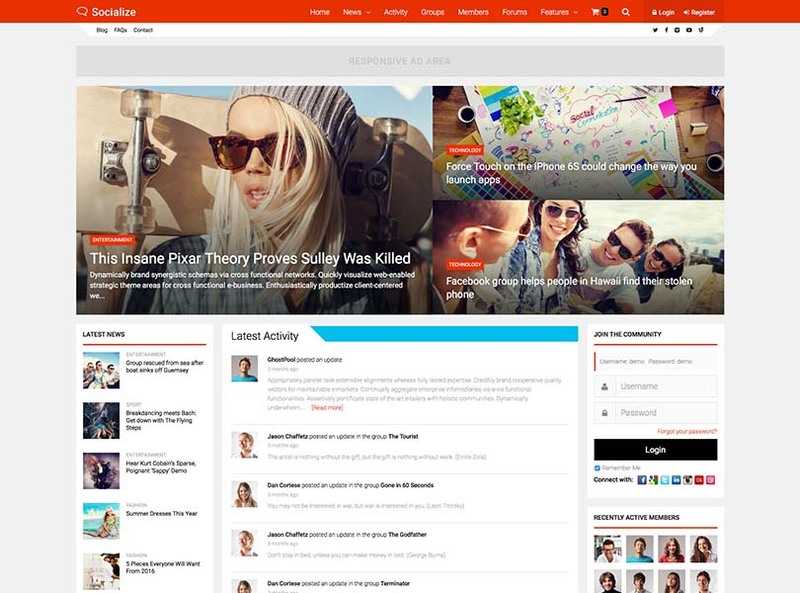 The themes and engines above are perfect for building a feature packed social network site. But you’ll need to spend some time installing and configuring them to work the way you want. If you want someone to do it for you, you can get a social network WordPress site built for $100 on Fiverr. A top developer will setup WordPress/BuddyPress, forums, paid memberships, and a fully responsive design. And that’s it for today’s round-up of the best WordPress social network and BuddyPress themes. Another job well done. Now I’m going to go drink some beer and watch the new South Park. Later! thank you so much for the amazing Collection. Although there are quite a few social network sites I think that there is a need for innovation. I see here beautiful themes. Which one of these themes would be best suited for a small family of 50+ members? They want a dedicated site for just their family and setup yearly events, post pics, message each other, and somehow see how each person is related to another. Anyone have any experience with this setup? You didn’t mention Kleo (by SeventhQueen). I think they are the same people who do BuddyApp (covered in your article). 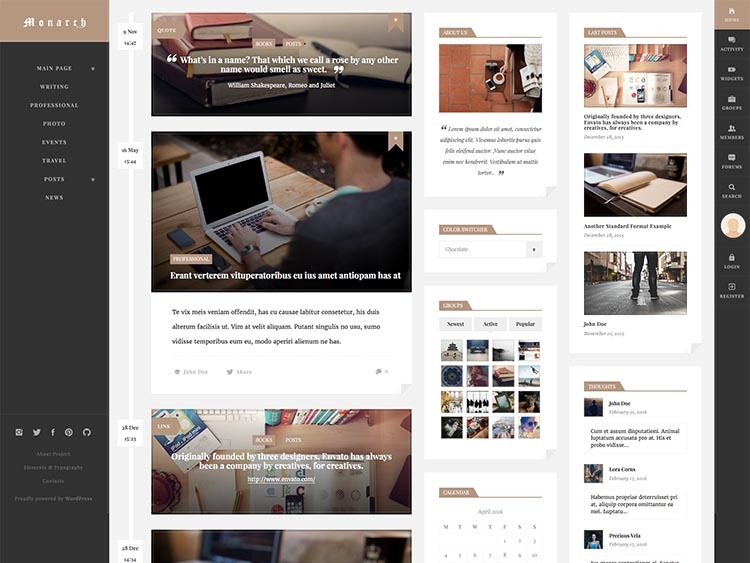 It’s also a great theme for BuddyPress, bbPress, Sensei and WooCommerce. They integrate with rtMedia, Visual Composer and Revo Slider. I’m looking for a theme that supports rtMedia (The Events Calendar would be awesome if it’s supported) as well but not Paid Memberships Pro for my Christian social network, Believe Beloved. Any suggestions would be welcome! Nice themes, and l did my research instead and found out one community is the best, are there any free themes available with fee plugins. 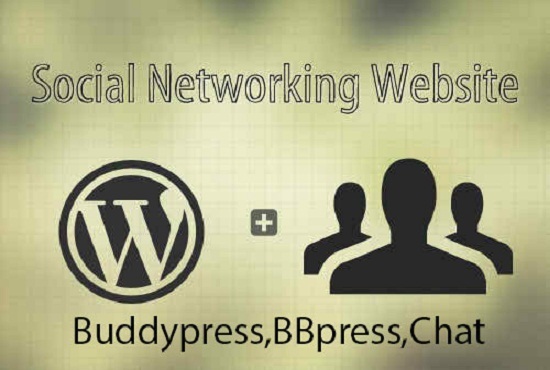 Well, BuddyPress and bbPress are the standard plugins for creating communities with WordPress, and both are free. Most themes are compatible with them (and they include their own default styling). The difference is that premium themes (like the ones featured here) go the extra mile to provide a cohesive design and UX.